Foliage.org: What are the projected dates Nacogdoches, Texas peak foliage seaso n? Generally peak foliage time is the last two weeks in November but the autumn leaf colors are on the trees for several weeks before and after that time. Are there areas, vistas, scenic lookouts or other destinations within Nacogdoches that are known for their uniquely beautiful autumn foliage displays? Located on Hwy. 7 East in Nacogdoches County, is a great place to see the foliage of the surrounding area. Covered picnic tables makes it an even better place since you can sit down and enjoy a nice meal while taking in the picturesque beauty of East Texas. Highway 7 East and West, as well as Highway 21 East and West, which is known as the El Camino Real (the King’s Highway). We also have a driving map available at the Visitor Center. Millard’s Crossing Historic Village – A charming reconstructed historic village, which enables visitors to imagine East Texas as it was in the 19th century. Stone Fort Museum – The campus of Stephen F. Austin State University is home to a fort that never served as a fort. Stone Fort Museum was a trading post, private home, church, jail and saloon. It was built three times – torn down by men and rebuilt by women. Old University Building – It is the only original building of a university chartered by the Republic of Texas still standing and is listed on the National Register of Historic Places. 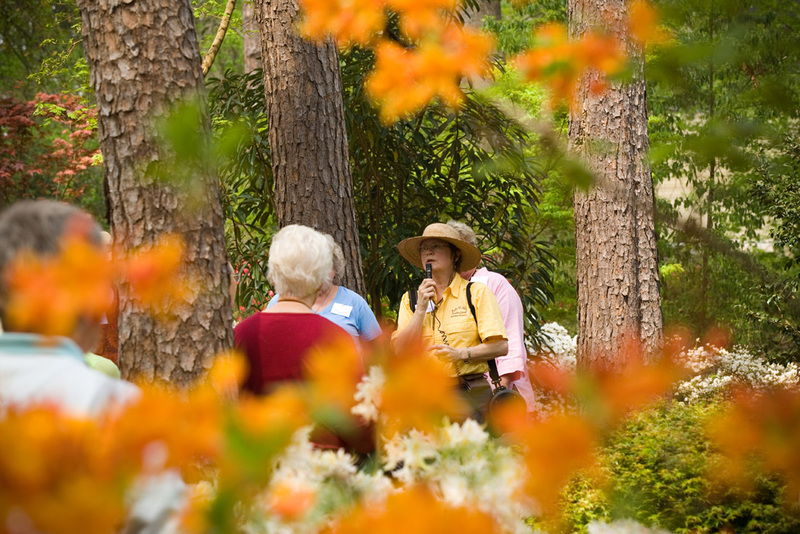 What are some other popular tourist attractions for autumn travelers to Nacogdoches. What are some of the less well known, but much loved local attractions? SFA Mast Arboretum- The first arboretum at a university in Texas, this on-campus garden spills over 19 acres and lies on a portion of the Lanana Creek Trail. Lanana Creek Trail- Originally an Indian footpath, this 2.5-mile trail weaves through thickets of paw-paw, dogwood and scarlet blooming buckeye. The trail begins at Liberty Hall on East Main Street in historic downtown Nacogdoches. SFA Pineywoods Native Plant Center- The Pineywoods Native Plant Center is a 40-acre garden on the north end of the Stephen F. Austin State University campus. It’s a unique mixture of uplands, mesic mid-slopes and wet creek bottoms. The Tucker House serves as the central feature of the property,which is surrounded by native forest and gardens that celebrate the wonderful diversity of native plants in the region. Sterne-Hoya House and Museum- It is the oldest structure still standing on its original site in Nacogdoches, TX. The collection includes Hoya objects from the Victorian Age and objects from the Empire period when the Sternes’ owned the home. The Sterne-Hoya house was a boarding house for the likes of many important men, such as Sam Houston. A small reference library is also part of the collection and is still used by visitors looking for information on local and Texas history and genealogy. Durst Taylor House and Gardens- The house is the second oldest structure still standing on its original site in Nacogdoches. The grounds include a blacksmith shop, smokehouse and historic gardens. Zion Hill Baptist Church- The Victorian features of this church include scrollwork in porch gables and window headings, cupola, steeple tower, and towers above the north and south entrances. The cupola and three towers feature knob and spire finials. It also includes Gothic features such as the pointed-arch windows of steeple tower and the cloverleaf molding of round-arch windows above the multi-window complexes. Deidrich Rulfs Architectural Driving Tour- Architecture throughout Nacogdoches reflects the work of one of Texas’ most noted designers. The trademark detail of Diedrich Rulfs can be seen in many of the city’s historic structures. Our website offers a driving map of his properties. Downtown Nacogdoches boasts many antique stores for the lovers of all things vintage. Definitely Millard’s Crossing Historic Village as well as the many parks and trails that Nacogdoches has to offer. Our website, www.visitnacogdoches.org, has all of the resources one needs to find the perfect place to stay and dine. For a visitor packet, call 1-888-OLDEST-TOWN. Is there anything else you would like to tell visitors thinking about traveling to Nacogdoches for the fall foliage season? Come to the Oldest Town in Texas to see the best fall foliage around! Call the Visitor Center at 1-888-OLDEST-TOWN so we can help you plan your trip to Nacogdoches! Special thanks to Samantha Mora of Nacogdoches Convention & Visitors Bureau for providing us with these in depth answers on the best Texas fall foliage in Nacodoches.